We are still cleaning up around here! The nesting continues…but not as strongly as before. It may be because the kids started back to school and I am their local bus service. 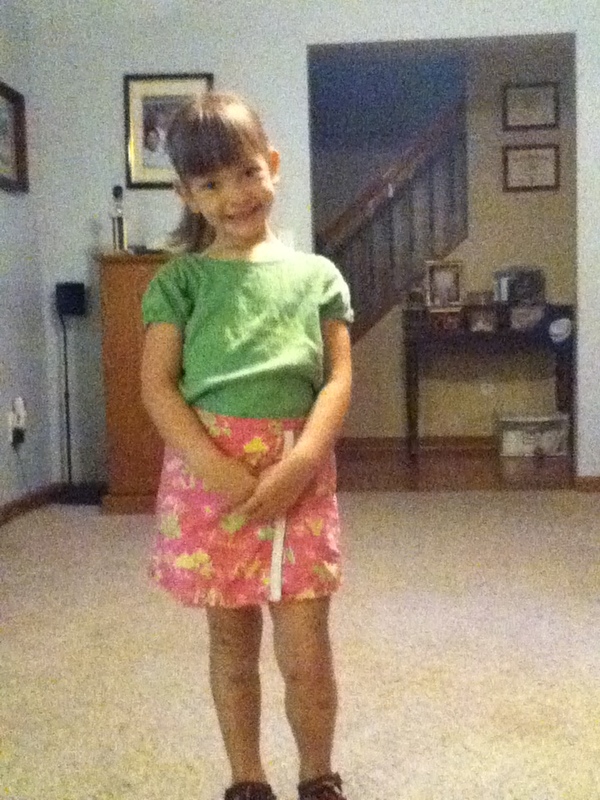 We have a Kindergartener this year, so that means I am to school 3x per day. Morning, noon, and after school. I love doing it, but it makes it harder to get things done around the house. All of the bigger projects have to be on the weekend.Anyway this week I was able to get some kitchen cabinets cleaned out and I was able to do my 5 things in the evening that Moneysavingmom.com has been doing a series on for the past two weeks. My 5 things to do before going to bed to make my morning smoother are: 1. Clean kitchen 2. Sweep kitchen floor. 3. Run dishwasher…you don’t know how many times I load the thing and forget to turn it on! 4. Get the coffee pot loaded and on the timer to start in the morning. and 5. Take a nice hot bath and relax for a few minutes before bed. I have been pretty faithful with the chores and it is helping make my day a LOT better and more relaxed first thing in the morning. Also, my husband has been on the bandwagon with me. He went through a big stack of boxes and condensed it down to a couple of boxes. 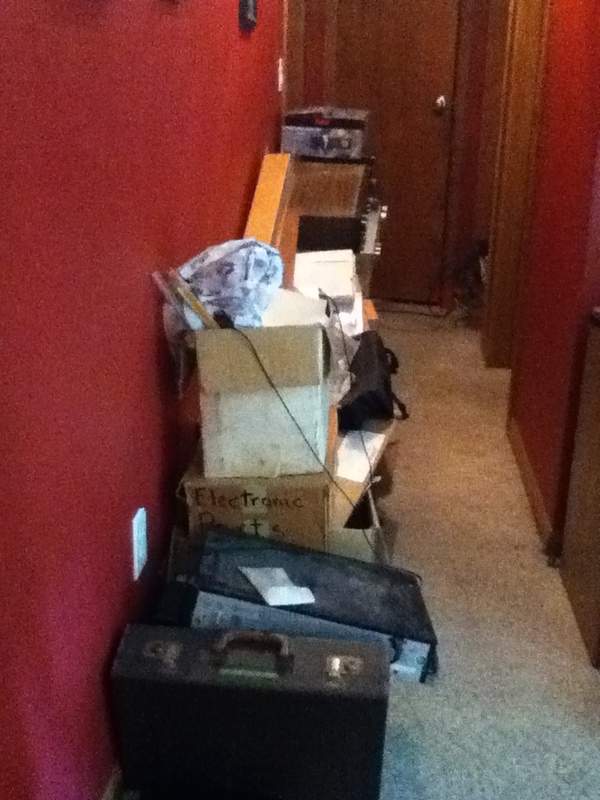 This stuff has been in our basement since shortly after we built the house. My MIL wanted all of his stuff out of the house and would bring loads of stuff every day until it was all gone from her house and dropped off at ours. It has been sitting in our basement ever since…about 15 years! Yesterday he went through the entire stack. 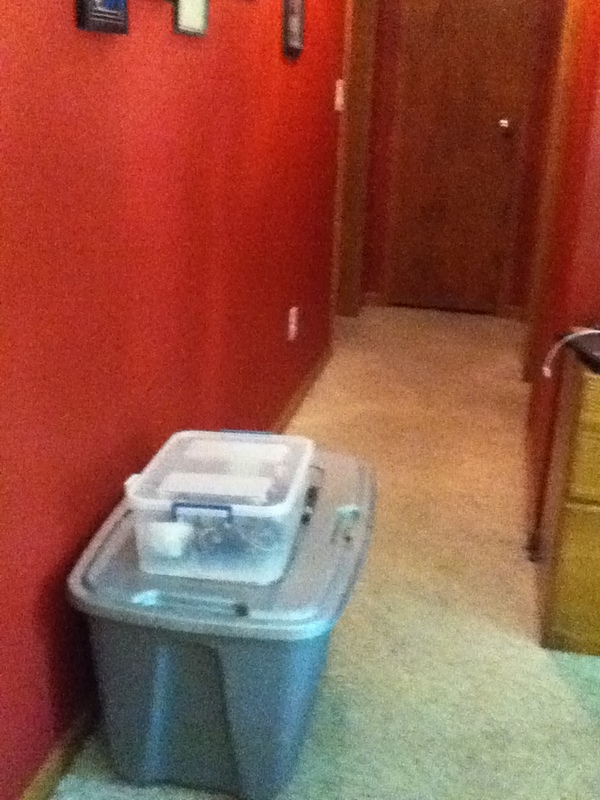 Our hallway before cleaning the mess up! After the project was cleaned up! I am so happy to have this stuff cleaned up! A big thank you to my wonderful husband for cleaning that stuff up! We are making good progress, but with school in full swing, I am sure it will slow down, but I am thankful to get the stuff that we have done taken care of. I will try this week to clean out our entry closet and our game closet. That will be enough to get done. I will try to remember to take pictures of before and after. I hope you have a great and productive week! 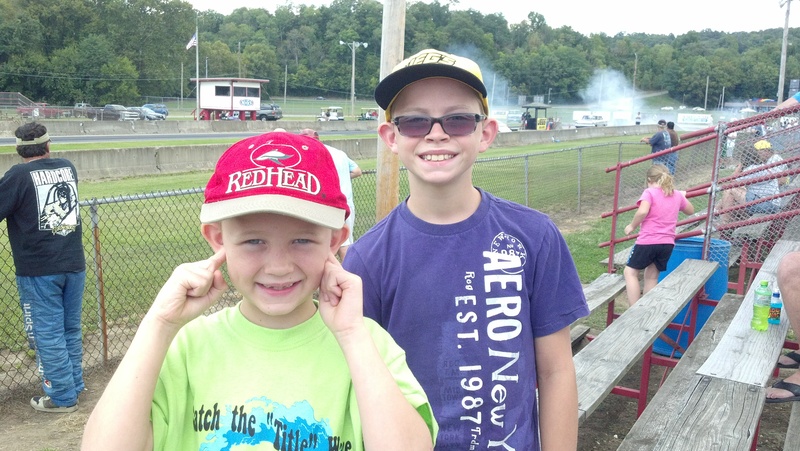 My husband took T and S to the drag strip the day before school started. They have been wanting to go all summer, but it just hasn’t happened. So while they were gone M and R helped me in our basement cleaning project. 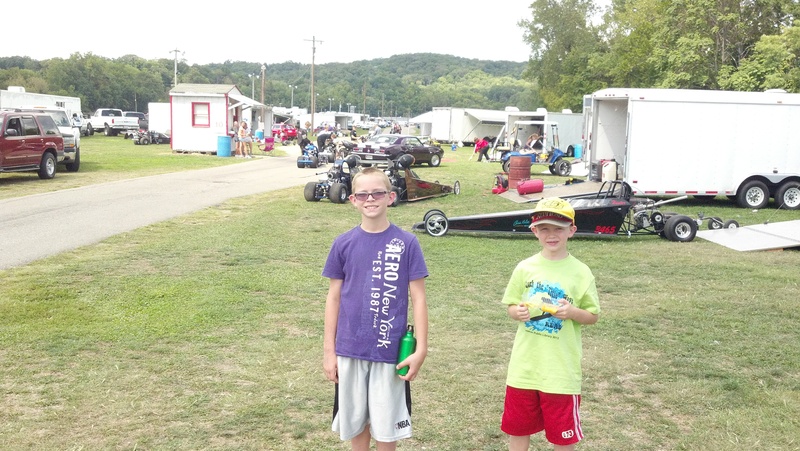 The drag strip is close to an hour away and by the time they got there and back, we had a lot of stuff cleaned out. Yeah! 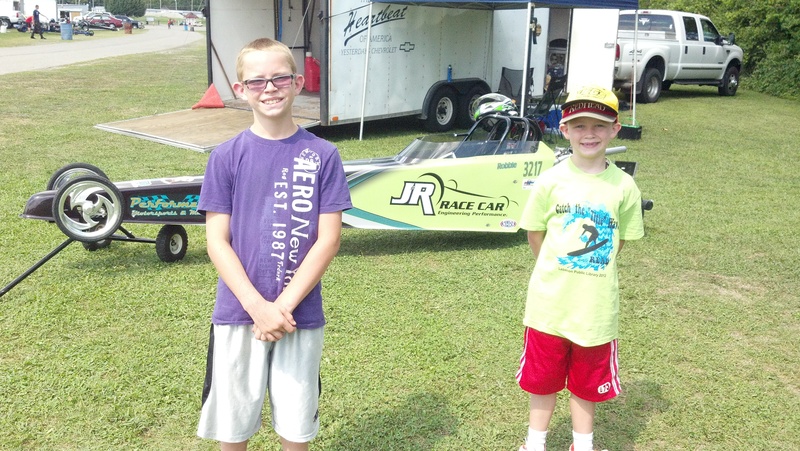 T really enjoys the whole process, and he really wants a Jr. Dragster. S enjoyed his time with T and Dad, but he just didn’t really care about the racing. Funny how 2 kids with the same parents can be so different! Here are a few pictures from their trip. T and S in front of a “cool” car. 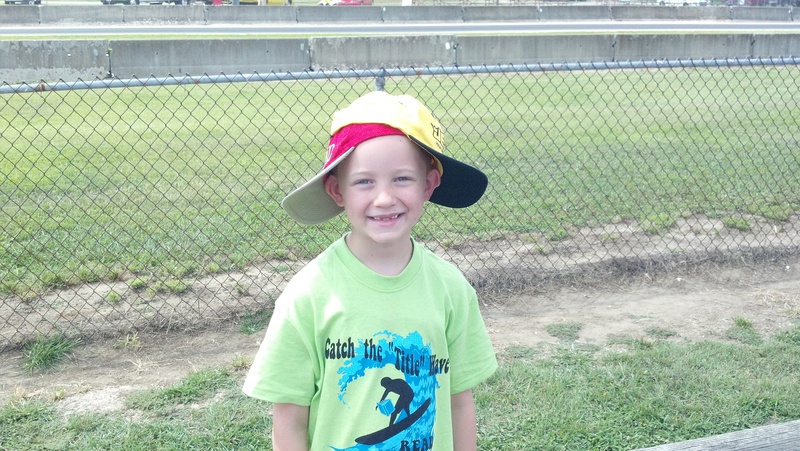 S being crazy by wearing 2 hats. T and S in front of a race truck. This race track sure is loud! 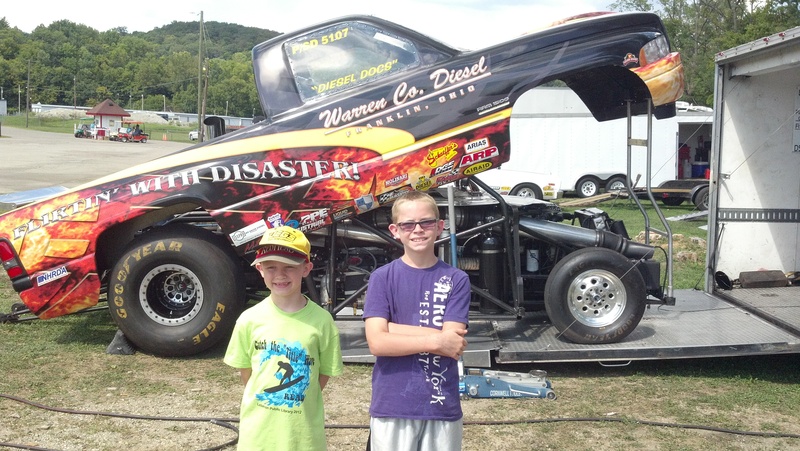 In front of a Jr. Dragster. It was a fun afternoon. T wants to go back as soon as possible! A, my little sweet tooth! We had a great time at our family reunion last weekend. The kids got to see some of their cousins that they only get to see once a year, and their favorite cousins that they see a little more often. We rent a Pavillion and each bring a covered dish. We have to travel about 3 1/2 hours to get there, but the kids were excellent in the van. Having unlimited electronics definetly helps. 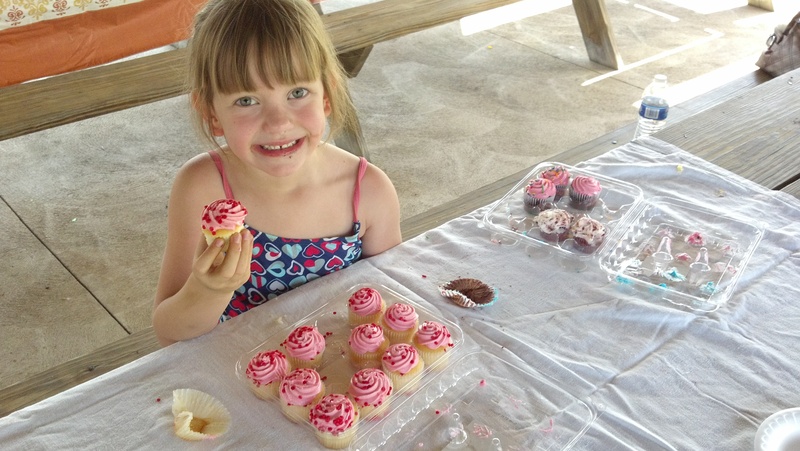 We had a few technical glitches that caused some frustration for our 5 year old, but otherwise everyone was awesome. We arrived a little bit later than I wanted because we ran in 3 different sets of orange barrels. Bummer! They have a pool at this community center, so the kids love it. They swam for quite a while. Pools are great for kids. They just never seem to get tired! It was nice to see some of my aunts, uncles, and cousins that I don’t normally get to see. There wasn’t a great turnout this year. It seems if we do it on Saturday people have to work, and Sunday doesn’t get a good turnout either. We prefer Saturday so that we have Sunday to recover before the week starts again! My dad has 10 out of 13 siblings alive and 9 made it to the reunion which was a really good turnout. My grandma will be 93 in a few days. She couldn’t make it because she wasn’t feeling well. I hope she feels better soon. It was great to see my parents, I haven’t seen them much as of late (because of all of our kids activities) and summer vacation is pretty much a free for all. They look great! I need to see them more and talk to them more, but it’s hard with my plate so full of kids, Boy Scouts, Cub Scouts, American Heritage Girls, school, drum lessons, etc. Thankfully they understand my situation and are glad whenever I call or visit! 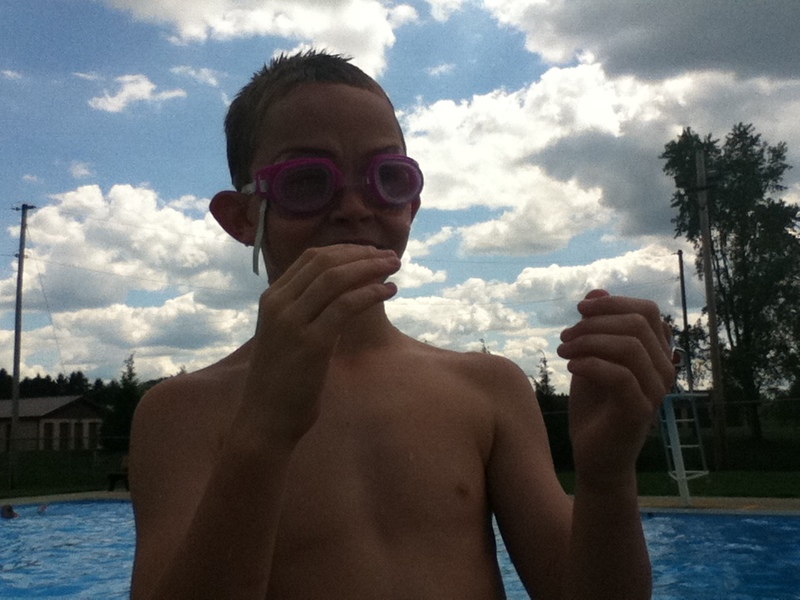 Here are a few pictures at the pool! 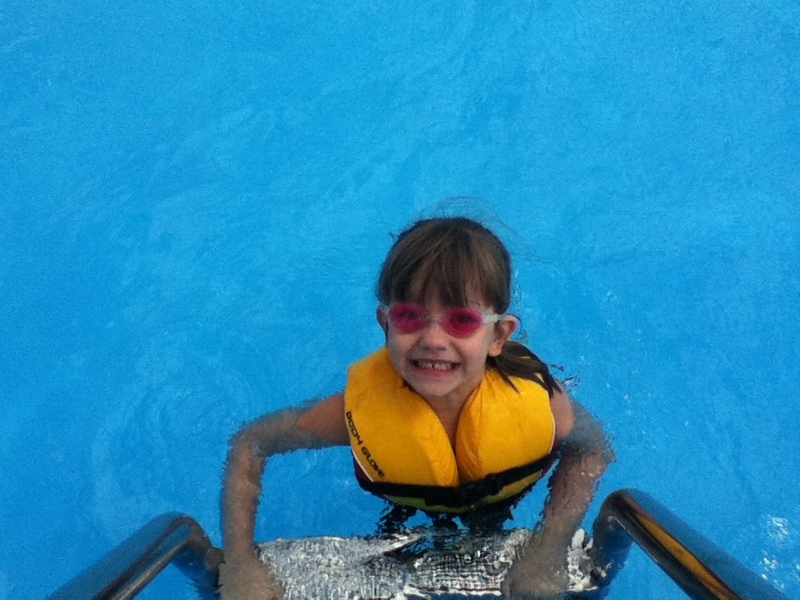 A swimming with a lifejacket. I am getting too large to get in the pool without causing a scene! 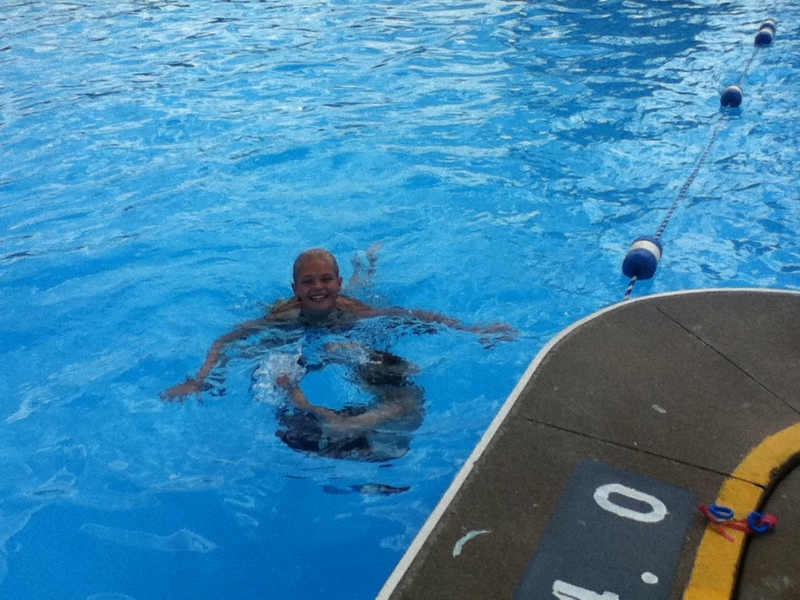 S trying to learn how to dive off of the low diving board. He is not good at diving yet, but he can do a heck of a belly smacker! 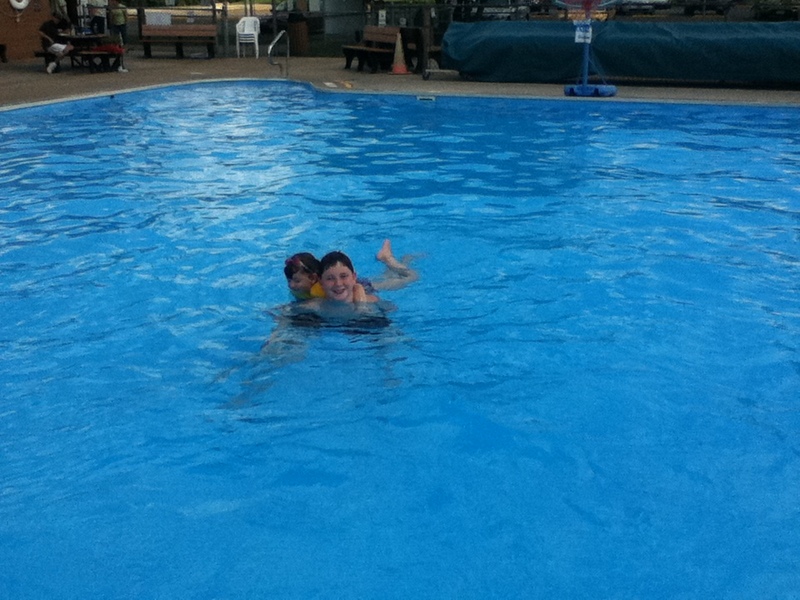 Cousin R, having fun in the pool with our kids! T telling me about his latest dive. More fun in the pool. R and A having fun together. 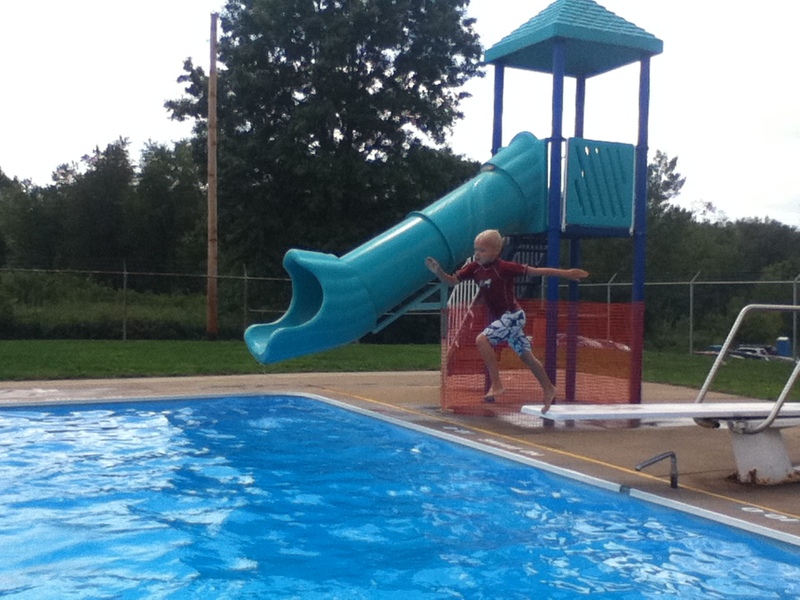 Cousin B, jumping off of the diving board. S acting goofy for his first day of school picture. He is in 2nd this year. It’s time for another first day of school. My kids are less than thrilled….well a couple of them. My 5th grader, T knows the drill, so he isn’t thrilled, S, my 2nd grader is excited, but didn’t like being awakened so early in the morning. My daughter A is starting Kindergarten. She is ready to go. She is usually a sleepy head who doesn’t like to get up in the mornings, but this morning she had a spring in her step and was ready to start school every day like the big kids and like how daddy goes to work. We will see how thrilled she is after the first week. I suspect that she will be very tired by Thursday morning. 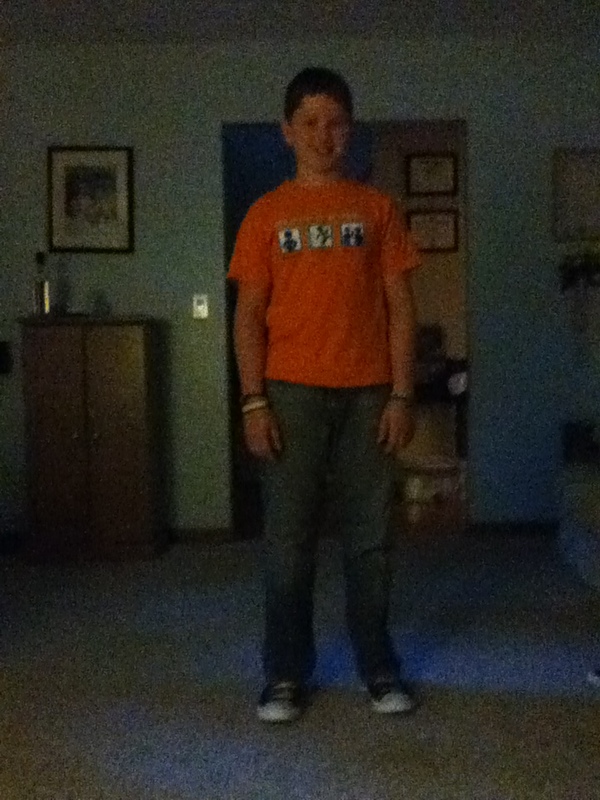 R my 8th grader is fairly excited because it is his last year at our current school. He will be in high school next year!!! 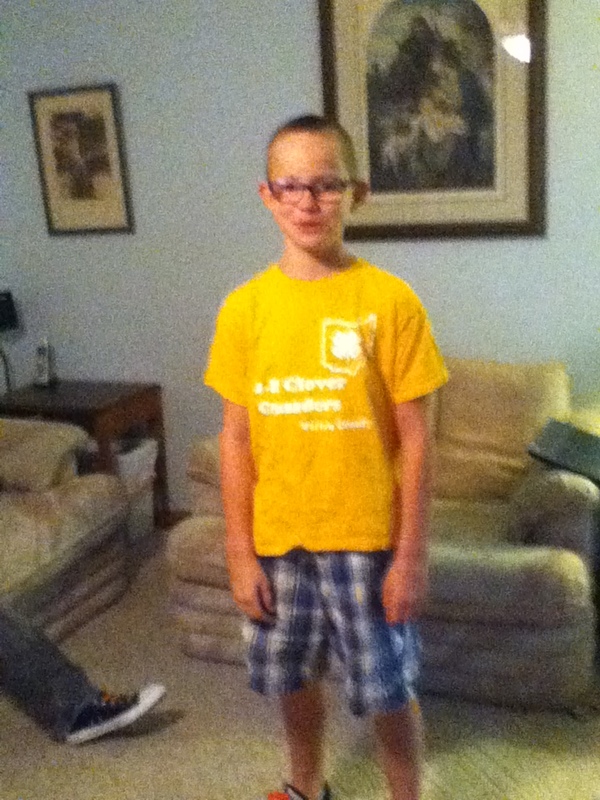 R starting 8th grade…his last year at this school! 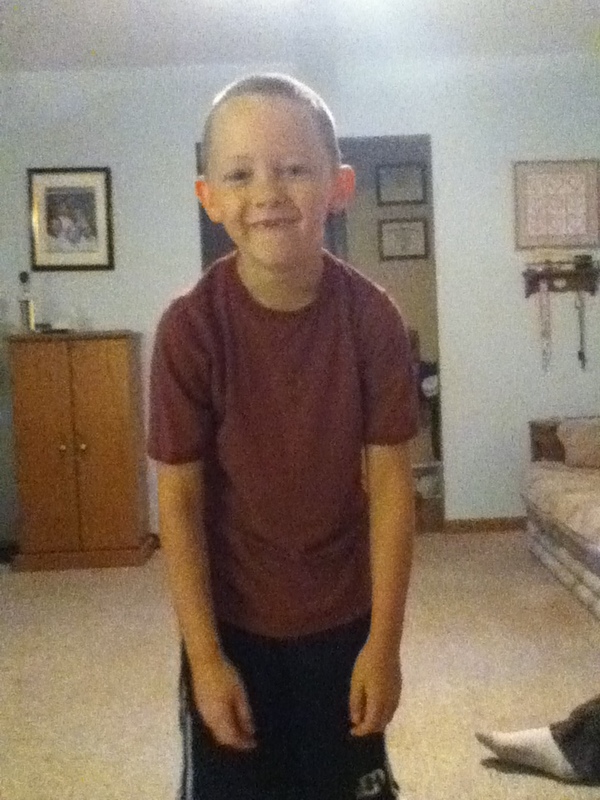 T starting 5th grade…on to Jr High next year!!!! My Junior and Freshman in High School don’t start until tomorrow, so we had a little bit of an easier morning trying to get everyone out the door. The day went pretty smoothly for them they all said. T said it was a boring day and all about rules, but he was excited about changing classes for Science. S said he had a great day, but he got a headache from thinking so hard. A, had a fun day. She spent a while telling me about all of the rules. She is excited to go back tomorrow for another day. R said it was a good day, but it feels weird being in the class with the oldest kids in the school. The kids sure have been full of energy tonight. I don’t know what the deal is…I hope it wears off. I had a couple of slower days around here. I’ve been pretty tired…I haven’t been sleeping well for the last couple of nights. I find that when I don’t sleep well, it takes a couple of days to get over the tiredness. I pretty much sat around and didn’t do much on Sunday. That’s not all bad…we had fun with the kids. Monday I had my doctor’s appointment and my 17 p injection (to prevent premature birth), so that was kind of a wash. That was a good thing too, because I was pretty tired. I did get the buffet in the dining room cleaned out and a box ready for Goodwill. Last night, I slept a lot better, so today I tried to get back on track. I did get T to tutoring, took kids to the library to finish up the summer reading program, and I took my MIL to physical therapy. After that I was pretty worn out, but I still managed to get under the sink cleaned out and the 2nd turn around cleaned out. I also cleaned some of the carpet in the living room. I am making progress…slower than I would like, but progress nonetheless. I hope I sleep well tonight, I would like to get a lot done tomorrow. On the chopping block the microwave, the bathroom cabinet, the rest of the living room carpet being cleaned, and hopefully clean T and S’s room. I hope it goes as planned. Here’s to good sleep and getting a lot done tomorrow! I was wondering what everyone thinks about Sam’s or Costco. My membership expires in a few days, so I am considering my options. I have been a faithful Sam’s customer for probably 6 years or so. My second year of having this kind of membership I switched from Sam’s to Costco just to try it out, but I didn’t like it as much because I felt like they had more clothing, etc than food, so I switched back to Sam’s. My hairdresser has a Costco membership and she loves it. She has been telling me about all of the organic stuff that they have now. She says the prices are very good. She is thrilled with their selections. I am primarily looking for food for our large family. If you don’t know, we have 6 children, with number 7 on the way. I have 5 boys ages 16, almost 15, 13, almost 11, and 8. I have one girl who is 5. They LOVE to eat. At Sam’s I buy the bulk flour, sugar, rice etc. I also buy salad mix, yogurt, juice boxes, fruit cups, lunch stuff like cheese crackers, breakfast bars, and peanut butter and jelly. I also buy frozen veggies, fresh fruit and veggies when they are a good deal. I really haven’t bought anything that isn’t food. I am not much of a spontaneous shopper anymore. I have been training myself to buy what is on the list…and that’s it, unless it is a really good deal. Also, when I shop at Sam’s I am going there to buy food…that’s it! Do you have a preference? What bulk store do you like best? I would really like your help in this matter! Thank you! Still Moving In The Right Direction! I am continuing on my roll of getting a lot of things done around here! I have cleaned the inside of the dishwasher and the coffee pot, cleaned one turn around in my kitchen, and wiped the front of the stove and dishwasher. I also took all of the stuff off of the front of the refrigerator including all of the papers and magnets. I even put the miscellaneous stuff up there on the fridge into new correct spots. I also took a bakers rack, a fake Ficus tree, some extra clothes, some toy train track, and some miscellaneous stuff to Goodwill. That feels good. I still have plenty to do, while I have some energy. I am kind of wondering why I am feeling the nesting instinct so early. One reason may be because the rest of the kids start school next week and then all of my help will be gone or doing homework. Another reason is that I have been there, done that many times, and I know what is to come. A third possible reason is that this baby could come early…I think that is part of the been there done that…and I have had 2 premature births at 35 and 36 weeks. Not terribly premature, but enough to be scary and have some complications. Anyway, while I feel the urge to purge and clean, I am going to go with it! I hope you are having a productive weekend!